Definition at line 23 of file DispatcherX86.h. Returns true if byte v has an even number of bits set; false for an odd number. For instance, byte order should be little endian. Definition at line 117 of file DispatcherX86.h. Referenced by create(), and Rose::BinaryAnalysis::InstructionSemantics2::LlvmSemantics::Transcoder::instanceX86(). Construct a prototypical dispatcher with a specified address size. The only thing this dispatcher can be used for is to create another dispatcher with the virtual create method. Definition at line 123 of file DispatcherX86.h. Definition at line 128 of file DispatcherX86.h. Definition at line 134 of file DispatcherX86.h. 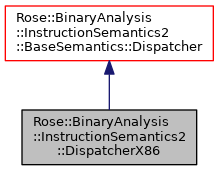 Dynamic cast to a DispatcherX86Ptr with assertion. Definition at line 144 of file DispatcherX86.h. Get list of common registers. Returns a list of non-overlapping registers composed of the largest registers except using individual flags for the fields of the FLAGS/EFLAGS register. Definition at line 167 of file DispatcherX86.h. Similar to RiscOperators::readRegister, but might do additional architecture-specific things. Similar to RiscOperators::writeRegister, but might do additional architecture-specific things. For instance, writing to a 32-bit GPR such as "eax" on x86-64 will write zeros to the upper half of "rax". Set parity, sign, and zero flags appropriate for result value. Conditionally set parity, sign, and zero flags appropriate for result value. Conditionally invert the bits of value. The bits are inverted if maybe is true, otherwise value is returned. Determines whether value is greater than or equal to ten. Return a Boolean for the specified flag combo for an instruction. Enters a loop for a REP-, REPE-, or REPNE-prefixed instruction. The return value is true if ECX is non-zero or the instruction doesn't have repeat prefix, and false otherwise. Use this in conjunction with repLeave(). Leave a loop for a REP-, REPE-, or REPNE-prefixed instruction. The in_loop argument is the Boolean that indicates whether we just executed the instruction, and is usually the return value from the previous repEnter() call. If in_loop is false then this function is a no-op. Otherwise, the ECX register is decremented and, if it is non-zero and the repeat condition (true, equal, or not-equal) is satisified, then the EIP register is reset to the specified instruction address causing the instruction to be repeated. Use this in conjunction with repEnter(). The REP and REPE prefixes are shared, both represented by x86_repeat_repe, and we use the honorZeroFlag to decide whether the prefix is REP (false) or REPE (true). Adds two values and adjusts flags. This method can be used for subtraction if b is two's complement and invertCarries is set. If cond is supplied, then the addition and flag adjustments are conditional. Increments or decrements a value and adjusts flags. If dec is set then the value is decremented instead of incremented. If setCarry is set then the CF flag is affected. Implements the RCL, RCR, ROL, and ROR instructions for various operand sizes. The rotate amount is always 8 bits wide in the instruction, but the semantics mask off all but the low-order bits, keeping 5 bits in 32-bit mode and 6 bits in 64-bit mode (indicated by the rotateSignificantBits argument). Implements the SHR, SAR, SHL, SAL, SHRD, and SHLD instructions for various operand sizes. The shift amount is always 8 bits wide in the instruction, but the semantics mask off all but the low-order bits, keeping 5 bits in 32-bit mode and 7 bits in 64-bit mode (indicated by the shiftSignificantBits argument). The semantics of SHL and SAL are identical (in fact, ROSE doesn't even define x86_sal). The source_bits argument contains the bits to be shifted into the result and is used only for SHRD and SHLD instructions. Push floating-point value onto FP stack. Pushes the specified value onto the floating-point circular stack. The current top-of-stack is the REG_ST register, but whose minor number is the value stored in the REG_ST_TOP register. The value in REG_ST_TOP (which must be concrete) is decremented modulo eight before being used. Read a value from the floating point stack. Pop the top item from the floating point stack. Extend or truncate value to propert memory address width. Convert a signed value to a narrower unsigned type. Returns the truncated source value except when the value cannot be represented in the narrower type, in which case the closest unsigned value is returned (zero or all bits set). Convert a signed value to a narrower signed type. Returns the truncated source value except when the value cannot be represented by the narrower type, in which case the closest signed value is returned. The closest signed value is either 0b1000...0 (minimum signed value) or 0b0111...1 (maximum signed value). Convert an unsigned value to a narrower unsigned type. Returns the truncated source value except when the value cannot be represented by the narrower type, in which case the closest unsigned value is returned. This register is cached so that there are not so many calls to Dispatcher::findRegister(). The register descriptor is updated only when the register dictionary is changed (see set_register_dictionary()). Register names like REG_anyAX have sizes that depend on the architecture: 16 bits for 16-bit architectures, 32 bits for 32-bit architectures, etc. The other register names have specific sizes–such as REG_EAX being 32 bits–and are defined only on architectures that support them. Definition at line 39 of file DispatcherX86.h. Definition at line 40 of file DispatcherX86.h. Definition at line 41 of file DispatcherX86.h. Definition at line 42 of file DispatcherX86.h. Definition at line 43 of file DispatcherX86.h. Definition at line 44 of file DispatcherX86.h. Definition at line 46 of file DispatcherX86.h. Definition at line 47 of file DispatcherX86.h. Definition at line 49 of file DispatcherX86.h. Definition at line 50 of file DispatcherX86.h. Definition at line 51 of file DispatcherX86.h. Definition at line 52 of file DispatcherX86.h. Definition at line 54 of file DispatcherX86.h. Definition at line 56 of file DispatcherX86.h. Definition at line 57 of file DispatcherX86.h. Definition at line 59 of file DispatcherX86.h.